Rich, fudgy and dense…this Chocolate Pudding Cake is a huge hit at family parties! I am in such a food coma right now. I ate so much last week while visiting my parents, I don’t really need to eat at all for a few more days, at least. 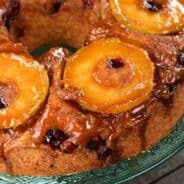 Yesterday I shared my Dad’s bread pudding that we ate, and today I’m sharing another recipe from last week. I knew my dad had requested that I make carrot cake for Easter, but I was going through a baking withdrawal. I am used to cooking something up nearly every day of the week. As much as I tried to relax and enjoy the time off, my taste buds were begging for some chocolate. Chocolate Cake to be exact. So, after searching my parents cupboards one afternoon, I realized they had all the ingredients to make a moist chocolate pudding cake. SO SO SO easy, and only a few ingredients. There are so many varieties you can make as well. This is a very dense cake because of the pudding, but quite a lovely treat! First, in a large mixing bowl, combine chocolate pudding mix with milk. Whisk until smooth. Add in chocolate cake mix and beat until well blended. Fold in chocolate chips. Pour cake batter into a greased 13×9 baking dish, and bake according to cake mix package directions. Top with Cool Whip (or homemade whipped cream) and sprinkles, refrigerate 4 hours or overnight. Cake will be moist and dense…perfect!! If you love today’s chocolate version, then you’ve got to try this Lemon Pudding Cake recipe. Virtually the same, with a few swaps in ingredients! 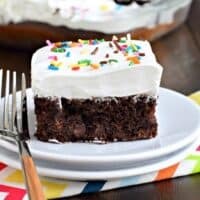 One of the easiest cakes to make! The pudding added to the top of the warm cake makes this so moist and delicious. Add some Cool Whip and toasted coconut and this Coconut Pudding Cake will be gone in no time! Chewy, moist, and packed with flavor. Thanks to the secret ingredient, these Chocolate Chip Pudding Cookies are always a hit! 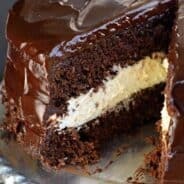 Moist, dense, Chocolate Pudding Cake recipe with 5 ingredients! In a large mixing bowl, combine chocolate pudding mix with milk. Whisk until smooth. Add in chocolate cake mix and beat until well blended. Fold in chocolate chips. Pour cake batter into a greased 13x9 baking dish, and bake according to cake mix package directions. Remove from oven and cool completely. Top with Cool Whip and sprinkles, refrigerate 4 hours or overnight. Cake will be moist and dense...perfect!! Recipe originally published April 26, 2011. Photos updated April 2015. Yum! Thanks for linking up to 2 Maids a Baking!! Oh I love me some Chocolate Cake! 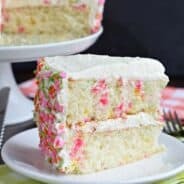 I’m having a linky party every week called a Themed Baker’s Sunday! Where every week there is a new theme, and this week its lemons!!! I’d love for you to drop by and link yourself up with any lemon recipe you have, old or new! Can’t wait to see what ya got up your sleeve!! So easy and so delicious looking. Your Pudding Cake looks delicious, Yummy! Thank you so much for sharing with Full Plate Thursday and looking forward to seeing you next week! This looks yummy, and I typically have all these ingredients on hand–score! Ooo, chocolaty and delicious. I love the butterscotch idea you posted as well. I’m a new follower, I’m loving your recipes. Have a great week. Does the cake not need any eggs/oil? Can i microwave the chips till they melt and then add it to the recipe? I don’t like crunchy things in my cake. Do you use the eggs, oil ect. listed on the cake mix box? Why does it need to be refrigerated? Because of the whipped cream topping 🙂 Plus it tastes better cold! You and me at easy. And pudding. 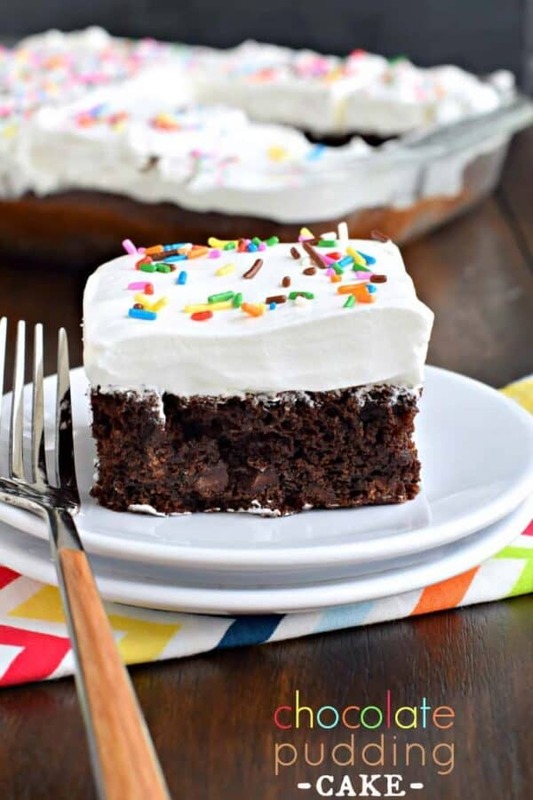 Totally need to try this–I love pudding in cake recipes! This is the best cake ever. My kids won’t stop asking me to make it for them. My kids would LOVE this!! It looks and sounds amazing! I just made it and it was perfect! So easy too!! I can never eat just one piece of this! So good!